SpheroMatrices, a proprietary spheroid tissue microarray technology for de-risking drug safety/efficacy studies. 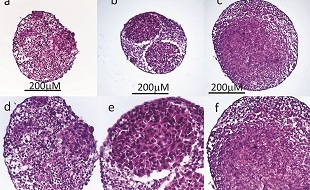 Addressing translatability issues in preclinical drug testing via new analytical processes for profiling 3D organotypic models: spheroids, organoids, PDX 3D models. Specialist Investigative Toxicology services for risk assessment. Elucidating toxicological/therapeutic mechanisms through the application of integrated genomic/epigenomic/proteomic profiling (mRNA, miRNA, ChIP on chip, LC MS/MS) and pathways analysis. Toxicological/pharmacological mechanisms are very often cell type specific. MicroMatrices specialises in high resolution cell type-specific analyses to characterise the toxicological response in different cell types in the tissue; please see our Services page for details/case studies. This approach can facilitate the design of better in vitro models for assessing the relevance/ translatability of mechanisms identified in animal models to man.